Bloomsday is being celebrated in Dublin with a style and gusto this year that James Joyce undoubtedly would find endearing and entertaining. Joycean scholars have used the clues in Ulysses to construct biographical portraits of Leopold Bloom. Shortly before his marriage to Ellen Higgins in August 1865, Rudolph Virag, a Hungarian Jew who had moved to Dublin, was baptised and received into the Church of Ireland by the Revd Thomas Wellard, and changed his name to Rudolph Bloom. Their first child, Leopold, was born at 52 Clanbrassil Street in May 1866, and was baptised in Saint Nicholas Without, the parish church of the Coombe, by the Revd Gilmer Johnston. But this baptism is a literary device, for Johnston is a fictitious character and the church was demolished in 1862. My grandfather’s cousin, James Comerford, lived at 50 Upper Clanbrassil, and there are references to the Comerford family in Ulysses that may have prompted placing the plaque two doors away at No 50, claiming this was Bloom’s birthplace. But what if Rudolph Bloom was born not at No 52 Upper Clanbrassil Street but at No 52 Lower Clanbrassil Street, and that the plaque was erected on the wrong house? At the turn of the 19th and 20th centuries, the heart of the Jewish community in Dublin was in Lower Clanrassil Street. In the 1860s, however, there were few if any Jews living in Upper Clanbrassi Street, so it can be presumed that Joyce – and Rudolph Bloom – were referring to Lower Clanbrassil Street. However, No 52 Lower Clanbrassil Street has long been demolished in road-widening schemes, and if Joyceans had been true to Joyce’s intentions, no plaque would have been erected to mark the birthplace of Leopold Bloom. Although members of the Comerford family were living at No 50 Upper Clanbrassil Street on the first Bloomsday on Thursday 16 June 1904, by then my grandfather’s cousin, James Comerford, was dead. He died in 1903, and his widow Ellen was living in the house. If Joyce intended us to understand that Leopold Bloom was born in No 52 Lower Clanbrassil Street, then who are the Comerfords referred to in Ulysses? In her soliloquy, Molly Bloom recalls 1893, the year “the canal was frozen” and how she had too many oranges and too much lemonade at a party in the Comerfords’ home in Clanbrassil Street. She was caught short on the way home that night, and recalls how she had to use the men’s toilets in a pub, with great personal discomfort. But if Molly is referring to a party hosted by the Comerfords in 1893, she must be referring to Lower Clanbrassil Street. At the time, my grandfather’s eldest brother, James Comerford, lived at 62 Lower Clanbrassil Street. In the short space of a half century or little more, immediate members of this one branch of the Comerford family had addresses at least 15 houses in Lower and Upper Clanbrassil Street. Many more lived at different times in the same era in houses in the warren of streets off Clanbrassil Street, in Little Jerusalem, in Portobello and around Charlemont Street. If I add to that their in-laws, their cousins and their nieces and nephews, it must have been impossible at one time to walk along Clanbrassil Street any time of night or day without meeting and greeting another member of the Comerford family. It seems every second parson on Lower Clanbrassil Street was either a Jew or a Comerford. ● My grandfather’s eldest brother, James Comerford, his wife Lena Comerford, and their five children, who were living in two rooms. However, in the 1904 edition of Thom’s Directory used by James Joyce, this house stands out from all the tenements on the street as being the home of James Comerford. ● Their cousin James Comerford, his wife Ellen Comerford and their four children, who lived in one room. James Comerford died on 2 October 1903, aged “about 62 years,” according to the inquest that day, and it was his widow who later lived at 50 Upper Clanbrassil Street. ● The Keegan family, who were living in one room. Previously, this house had been the home of my grandfather’s cousin, Thomas Comerford, a plasterer, and his wife Mary Anne (Ludlow), who lived at No 62 in 1862, 1866 and 1872. In the 1860s, No 62 was also the home of Thomas Comerford’s sister Elizabeth and her husband Denis Cuddy, and in 1874, this house was also the home of another member of the family, Thomas Comerford and his wife Mary Jane (Cusack). 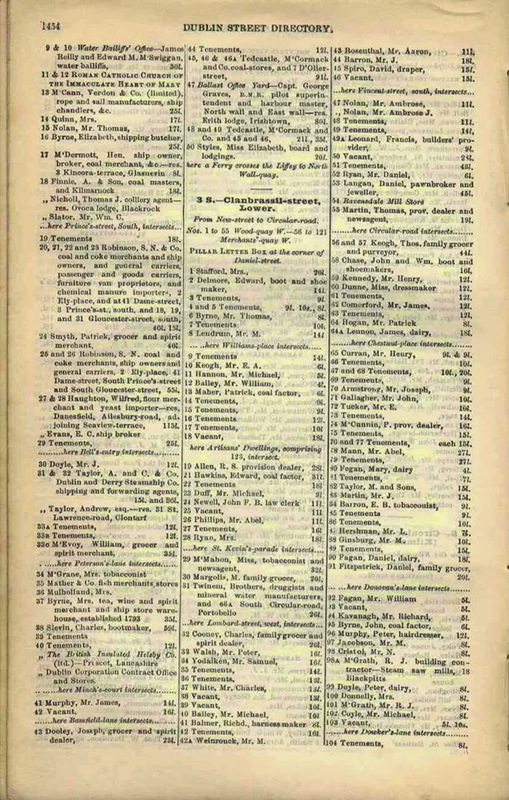 However, by the time of the publication of the 1904 edition of Thom’s Directory, which was used by James Joyce when he was writing Ulysses, No 62 Lower Clanbrassil Street stands out from the tenements on the street as being the home of James Comerford and his family alone. By 1911, James Comerford and his family were sharing 82 Lower Clanbrassil Street with his sister and brother-in-law, Mary and Francis Coleman family and thir family, and with Isaac Joffe, a 58-year-old Jewish shopkeeper from Russia and his Russian-born Jewish wife, Hannah. After the Comerford family moved out of No 62 in the early 1900s, the Mogerley family ran a butcher’s shop at No 62. The business was founded by Heinrich Mogerley, who arrived from Germany in 1908. Today, the site of 62 Lower Clanbrassil Street is the premises of Capital Glass. So if the Blooms got a Christmas card from the Comerfords in 1892, and Molly was at a party with the Comerford family in 1893, it must have been Joyce’s intention to refer to the Comerfords at No 62 Lower Clanbrassil Street, and not at No 50 Upper Clanbrassil Street. Joyce shows his familiarity with Lower Clanbrassil Street in Ulysses when he says Stephen Dedalus has an aunt Sara, wife of Richie (Richard) Goulding, and refers to her in the kitchen of their lodgings at 62 Clanbrassil Street … once again, a reference to the Comerford home on this end of Clanbrassil Street. But it was more convenient to erect that plaque in Upper Clanbrassil Street because No 50 Lower Clanbrassil Street has long been demolished in road-widening schemes and no longer exists. Why did James Joyce chose the family name Comerford for the Blooms’ friends in Ulysses? 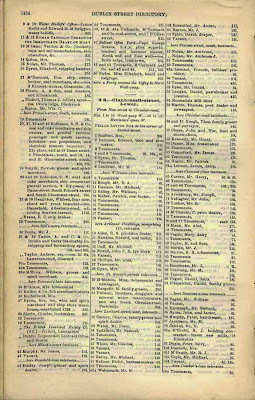 Apart from coming across my grandfather’s brother, James Comerford, at 62 Lower Clanbrassil Street in Thoms Directory, was there another reason that the family name caught his imagination? 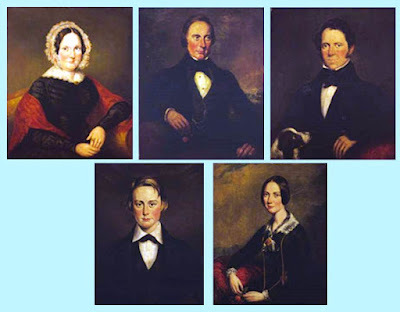 However, the Comerford name may have attracted Joyce’s attention because he claimed that a number of family portraits had been painted by the Kilkenny-born miniaturist, John Comerford (1771-1832). The University of Buffalo now holds the family portraits that were once found in the various places in Paris James Joyce had lived in. Although they are unsigned, Joyce claimed they were the work of John Comerford. In May 1912, he commissioned Daniel Egan, a carver and gilder working from Lower Ormond Quay, Dublin, to restore these family portraits and they were shipped to Trieste in January 1913. The five portraits had survived the constant moves from one house to the next by his impoverished and indebted father John Joyce and his family between 1881 and 1913, and had been moved to 20 different addresses. They are said to be portraits in oil of Joyce’s paternal ancestors: Anne McCann (his great-grandmother), James Joyce (his great-grandfather), Ellen O’Connell (his grandmother), and two portraits of James Joyce (his grandfather). When Ulysses became a publisher’s success, James Joyce commissioned Patrick Tuohy in 1923 to paint a portrait of his father John Joyce, then 74, to add to his collection of family portraits. Joyce told both Paul Léon and Arthur Power that the portraits were by John Comerford. On the other hand, Stanislaus Joyce thought the portraits were by William Roe. However, there is no evidence to link the paintings to either Comerford or Roe. Thomas Connolly says: “There is some reason to doubt the authenticity of the five portraits of Joyce’s ancestors …” He suggests they could have been “random portraits” acquired by John Joyce “to bolster the family’s credentials to gentry.” It seems, then, that the haughty portraits that Joyce was paying to have restored and shipped were part of John and James Joyce’s mythologising of the Joyce the illustrious past of the Joyce family. Meanwhile, there is another family connection with James Joyce that is worth recalling on Bloomsday. 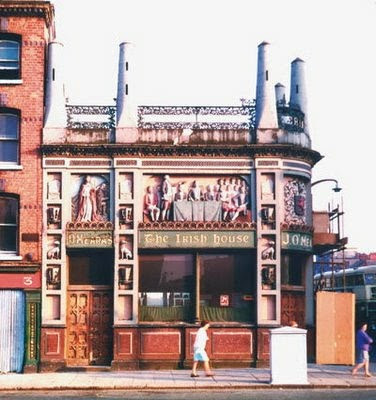 The Irish House, which stood proudly on the Quays of Dublin for almost a century after it was built, is alluded to by Joyce in both Ulysses and Finnegans Wake. The Irish House was built in 1870 at the corner of Winetavern Street and Wood Quay in Dublin, and became a popular public house and well-known piece of Celtic Revival architecture. The pub was designed by my great-grandfather James Comerford (1817-1902), and his partner, William Burnet. The Irish House was used as a backdrop for Joe Strick’s film adaptation of Ulysses in 1965. While Leopold Bloom had his mid-day snack on Bloomsday at Davy Byrne’s on Duke Street, Strick moved the scene to the Irish House, where Milo O’Shea played Bloom. Racist taunts aimed at Bloom from the midday drinkers resulted in a scene outside the façade. The Irish House shortly represented the pinnacle of James Comerford’s career as a stucco artist and architect. Curiously, The Irish House and its façade have gone the same way as No 52 Lower Clanbrassil Street … two relics of ‘Little Jerusalem’ and the story of Victorian and Joycean Dublin lost to the expediency of road widening and what passes for town planning.